Have you ever heard of a controversial dessert? Because that’s what we’re making today. Zabaione is one of my very favorite desserts, but in this country, it’s not liked by everyone (which baffles me completely). It is essentially a thick, sweet cream made with beaten egg yolks, sugar, and a liquid that is traditionally wine. It is typically made with dry marsala (never use sweet marsala! ), though it can also be made with spirits like cognac, liqueurs like cointreau, and wines like moscato, port, champagne, or any dry white wine. When made with spirits or liquers, it’s best to dilute them with equal parts white wine. Zabaione (which is sometimes incorrectly called Zabaglione) can be served warm or cold. It can be used to make cakes, pastries, and tiramisu. While it seems a little daunting to make the first time, you’ll get the hang of it faster than you’d think! This dessert should be cooked in a rounded-bottom copper saucepan, which is made for bagnomaria (bain-mariw) cooking, which is cooked in simmering water. While it can be coked in any sauce pan, if you’ve been looking for a chance to buy a new one, this is it! If you’re ready to make your zabaione today, here’s what you’ll need. Pull the eggs out of the refrigerator and let them come to room temperature (this is not essential, but it does help). Put a pot with water large enough to accommodate the saucepan for the zabaione on the stove and turn the heat to medium high. It doesn’t need to be boiling. 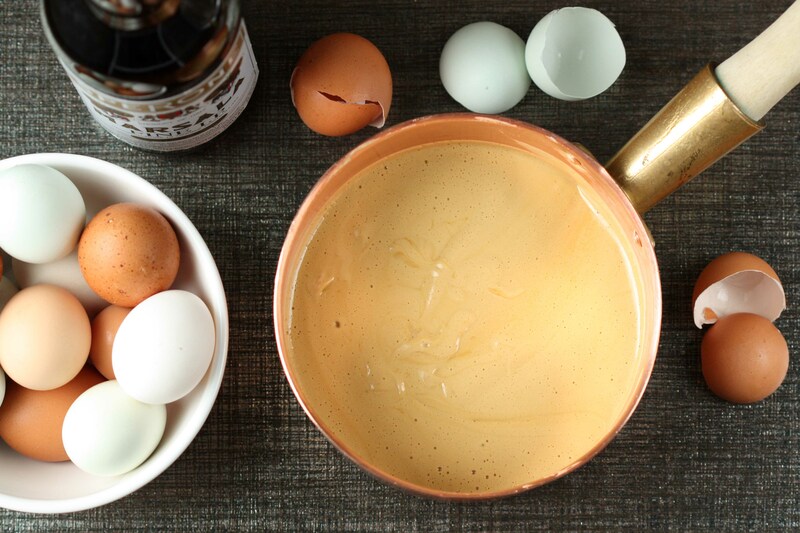 Place the egg yolks and the sugar into a bowl and beat at high speed with the hand mixer until much whiter (a stand mixture works just as well). Turn down the speed on the mixer and very slowly add the Marsala, adding increasing amounts as it gets absorbed by the mixture. The more you add (and the more the mixture becomes liquid), the more wine you can add at the time. Once it’s all well incorporated (no wine is visible), transfer it to a saucepan, and put the saucepan in the water. The water should not be boiling but rather simmering. The water can be hotter at first, since it will cool down upon exposure to the cold saucepan. Continually stir the sauce with a rubber spatula without pause. If you see that too much zabaione is sticking to the spatula while the rest is obviously not cooked, take the pan out of the water for 10 seconds while still stirring, and lower the temperature on the stove. Don’t try to rush the cooking process. You will know that it is ready when the mixture is inflated, soft, velvety, and uniform in consistency. There will be larger bubbles that will begin to form on the surface— just one or two persistent bubbles about 1/4” are enough. When lifting the spatula out of the mixture, the sauce could cling to the spoon before dropping off. It is technically cooked when it reaches 150˚ F, though it is hard to measure this whilst stirring, and if you take it out of the water the temperature will drop very quickly, causing you to possibly overcook it (or to go insane trying to take the temperature). Once ready, transfer it to a bowl or container. 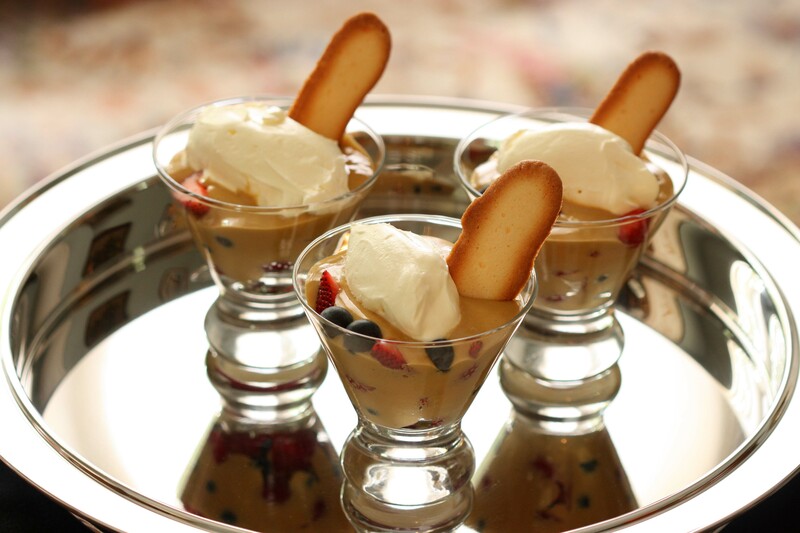 You can serve Zabaione immediately after cooking it, or let it cool a bit or refrigerate it for later use. As indicated above, it can be served by itself, with whipped cream, with fruits (berries work best), biscotti (Lingue di Gatto), or on gelato.